The world is not just rapidly changing, it is being dramatically reshaped. It is being reshaped faster than individual humans and the institutions are yet able to respond. Recent technological advances and disruptions have generated a world that operates so differently that we struggle to comprehend its meaning and adapt to the circumstances it presents to us. This new world poses profound challenges for organizations of all kinds as they try to cultivate resilience and simultaneously determine a source of growth. 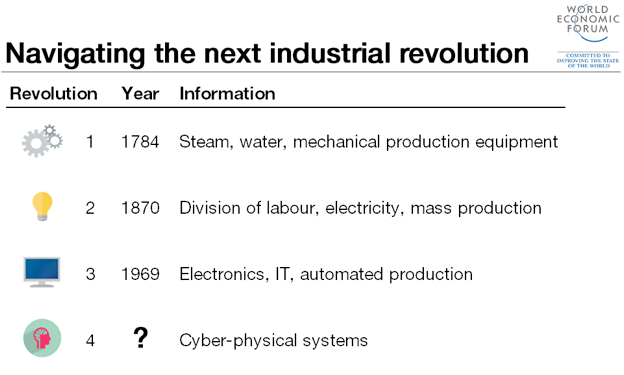 In January, World Economic Forum Executive Chairman Klaus Schwab recognized this challenge, referring to this economic and cultural upheaval as the Fourth Industrial Revolution . He particularly called out the fact that the boundaries dividing the physical and digital worlds are growing less defined, and the difference in abilities that so clearly separated man from machine is quickly eroding. We are in the midst of a revolution, one that dwarfs the so-called industrial revolutions that preceded it. What we are experiencing today bears striking similarities in size and scope to the Scientific Revolution of the 16th century. The discoveries of Copernicus and Galileo, which challenged our understanding of the world around and beyond us, inspired others to ask deep questions about the nature of humanity and how societies should be organized and governed. The Scientific Revolution disrupted the way the human race thought about itself. We now have a chance to embrace today’s revolution for what it is: a powerful, defining moment to rethink what it means to be human. Our present revolution is not only one where we will need to rethink the nature and structure of our industries and institutions, but also one where we will need to create new systems that put humanity at the centre and come to grips with the transformative implications of such a change. In a world that increasingly defers to the cognitive dexterity of artificial intelligence, only the human heart can animate morality, imagination, ethics, compassion and empathy. The human heart exhibits consciousness of others and designs technology whose aim is human advancement and elevation, not destruction. We must now work to put our humanity at the center of all of our endeavours. We can do this by cultivating our most unique human quality of all, our ability to pause. When you hit the pause button on a machine, the action stops. But when humans pause, that’s when true, reflective work begins. Empathy, compassion, imagination and other forms of elevated human behaviour cannot exist without pausing. By taking a step back from what is going on in our day-to-day lives, we free ourselves to reconnect to our deepest values and concerns, and face problems with integrity, courage and humility. It is in the pause that we can reflect deeply about our challenges. By pausing, we reconnect with our deepest humanity and our source of meaning. We rethink our assumptions and models and reimagine new institutions and pass it forward. This approach allows us to view our problems in entirely new ways. Machines will be able to carry out their assigned tasks, but only humans will be able to redefine, transcend and elevate those tasks. Machines can be measured according to whether they’ve met expectations. But humans are uniquely capable of focusing on how we collaborate, how we build trust, and how we innovate, recalibrating their behaviour as changes arise. So, how can business leaders and organizations create the conditions that will allow people to embrace their most uniquely human abilities? The HOW Report , a new cross-industry statistical analysis of 16,000 employees at companies spanning 17 countries, offers one way forward. It shows that self-governing organizations, those that are purpose-driven and give people the autonomy and flexibility to do their best work, are poised to achieve the best results in this new working world. The report classifies organizations into three models: “blind obedience,” “informed acquiescence”, and “self-governing”. Blind obedience organizations operate via command-and-control principles and policing. Employees are expected to follow the rules and are punished if they fail to act within specified parameters. Such organizations place little emphasis on building relationships among colleagues, with customers, or within society. In a sense, blind obedience firms treat people like machines. Informed acquiescence organizations are rules-based and process-driven. They operate through hierarchy and policy. They seek to motivate employees through performance-based rewards and punishments. While these organizations often have long-term goals, they also set them aside in the face of short-term challenges. These organizations often treat people like complex, adaptive machines. Self-governing organizations, meanwhile, put humanity at the centre. Such organizations are propelled by the pursuit of significance and are led via moral authority, not hierarchical authority. Self-governing firms focus on long-term goals and achieving sustainable performance. They are inspired by shared values and ethics, not policies and dictates. Unlike blind obedience and informed acquiescence, two hallmark organizational styles of the Industrial Revolution, self-governance is a uniquely human capacity. Machines are capable of functioning in blind obedience and informed acquiescence organizations. But only humans can operate in a self-governing environment. Simply put, self-governing companies are the most human of all kinds of organizations. 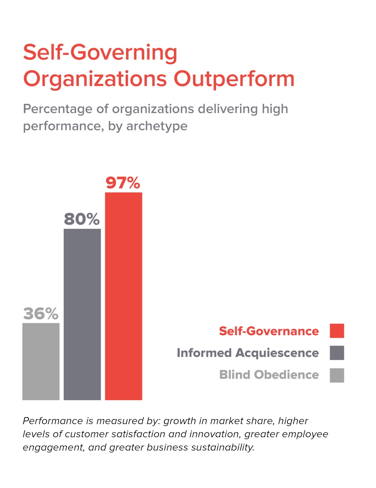 The report shows that self-governing companies outperform those that follow the other two organizational models on several accounts. 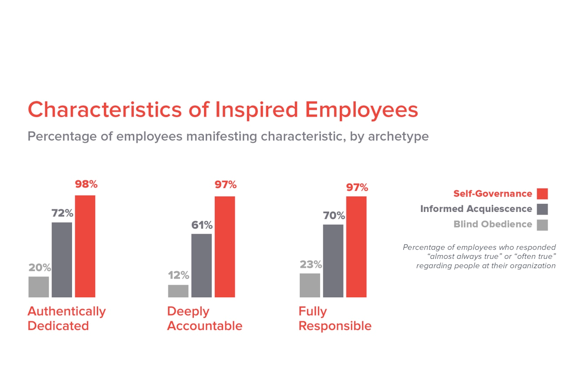 They are three times as likely to achieve high levels of performance as their blind obedience rivals, as measured by growth in market share, customer satisfaction, innovation, business sustainability, and employee engagement. When Bill Gates developed the Windows Operating System, he created an environment in which several of Microsoft’s applications could work together. Today, we must create a Human Operating System, the kind that will give elevated behaviours – courage, compassion and creativity – room to grow and flourish. And self-governing organizations are best positioned to achieve this.